A stir-fry requires quick cooking at a high temperature. Therefore, the recipes usually call for starting with an oil with a high smoke point, a term that refers to the temperature at which the oil burns. When that happens, the oil begins to break down, letting off black smoke and unpleasant fumes. This not only ruins the flavor of your dish by imparting a bitter taste but also makes the once-healthy oil now unhealthy because of potential carcinogens. Olive oil isn't high on the list when it comes to stir-frying because of its smoke point, which is about 375 F (compared to peanut oil at 450 F and avocado oil at 520 F). However, you can use it in a pinch if you choose pure or light olive oil over extra-virgin or virgin varieties. The higher the smoke point of an oil, the better it is for high-heat cooking such as stir-frying. 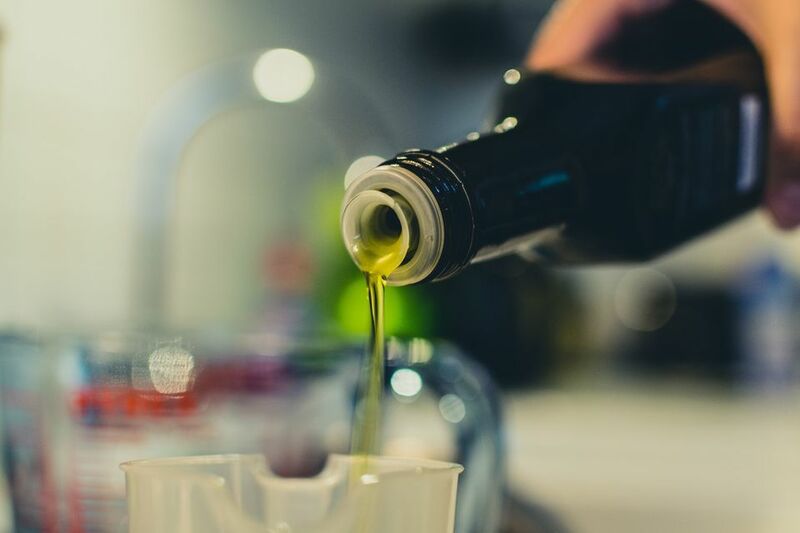 Standard olive oil, also called pure, refined, or light olive oil, has gone through a more rigorous refining process than extra-virgin or virgin olive oils, giving it a higher smoke point compared to other types. For example, extra-virgin olive oil has a 320 F smoke point while low-acidity extra-virgin olive oil smokes at 405 F with virgin olive oil tolerating slightly more heat with a 410 F smoke point. Pure/refined/light olive oil is the way to go having a smoke point with a range of 390 to 470 F.
The smoke point of light olive oil is comparable or higher than other types of oil you might use in a stir-fry, including a vegetable oil blend (428 F smoke point), sunflower oil (450 F smoke point), refined peanut oil (450 smoke point), and avocado oil (520 F smoke point). Stir-frying typically refers to an Asian-style dish, which has a unique combination of flavors. Olive oil, however, has a distinct flavor that's more often associated with Mediterranean cooking, given that's where the bulk of the world's olive trees grow. The flavor is most concentrated in extra-virgin olive oil, compared to other varieties. When you see "light" olive oil, it's not referring to the calories in the olive, but rather the color and the flavor, which is lighter and milder than other olive oil varieties. This makes it a better option in dishes that you don't want that characteristic flavor shining through, such as in stir-frying. Other types of oils are even more neutral in flavor than light olive oil, including vegetable oil blends, canola oils, and sunflower oil. This also makes them prime candidates for stir-frying. Although stir-frying is considered a fairly healthy cooking method, adding olive oil to the mix may increase the benefit, but only slightly. Olive oil is a rich source of monounsaturated fatty acids, particularly oleic acid, which may reduce inflammation. But the polyphenols—which are healthy plant-based compounds—are damaged by super-high heat. Heating the oil changes the chemical structure of the oil, which can really take a toll on the nutrient content. Additionally, extra-virgin olive oil, the least-optimal type for stir-frying, has the most health benefits. Given that extra-virgin olive oil is also the most flavorful and often the most expensive, save it for applications such as dipping bread or dressing salads.